LO-CHLOR “POOL SENTINEL” is a revolutionary, patented water care solution that removes BIOFILM from the walls and floors of pools. The answer is that it probably isn't even though visually they may think it is. Have you ever felt slimy walls? - We bet you have! It is only this 1% of these so called ‘free floating' bacteria that we are able to kill with traditional sanitiser's such as chlorine or bromine!! Unlike traditional water care products, LO-CHLOR “POOL SENTINEL” softens pool water and soothes skin without the harsh effects of chemicals. LO-CHLOR “POOL SENTINEL”, by breaking down the BIOFILM, completely reconditions the water and equipment, massively reducing the threat of contamination. As a result, there's less “killing” to do, which means the need for chemicals such as chlorine or bromine can be significantly reduced. With LO-CHLOR “POOL SENTINEL”, bathing in a pool becomes a special experience. 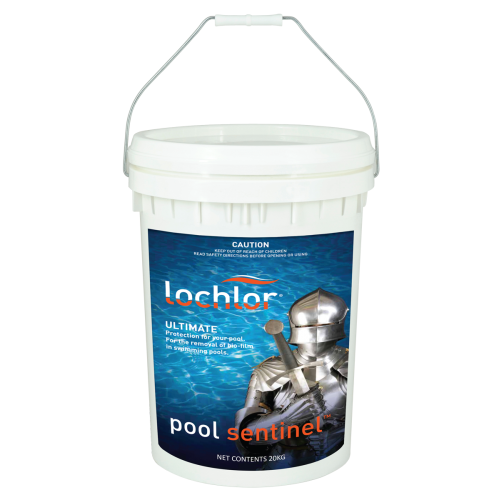 LO-CHLOR “POOL SENTINEL” must be used in conjunction with a recognised sanitiser.